At first glance, a fossa looks like some kind of cat, monkey, or weasel. It has paws with claws like a cat, a long tail like a monkey, and round little ears like a weasel, so it's easy to be confused! Although it shares some adaptive similarities with cats, the fossa is closely related to the mongoose and civet. Its coat is short and dense, usually a rich brown color with a golden tinge and a lighter-colored belly. The fossa's tail makes up about half of the animal's length! Myth-understood: Fossa legends could fill a book! Tales passed along include the belief that the scent left by a fossa kills poultry, the animal can contract its eye pupils so they will disappear completely, and that the fossa creeps into homes and steals babies from their cribs. Another tale tells of fossas that lick a sleeping person in such a way as to put the sleeper into a deep trance. Once under the spell, the sleeper is unable to awaken, and the fossa then disembowels its helpless victim. Improbable as these tales may seem, they reflect the cunning nature of the fossa. A fossa uses its sharp claws to climb up and down trees while hunting its prey. 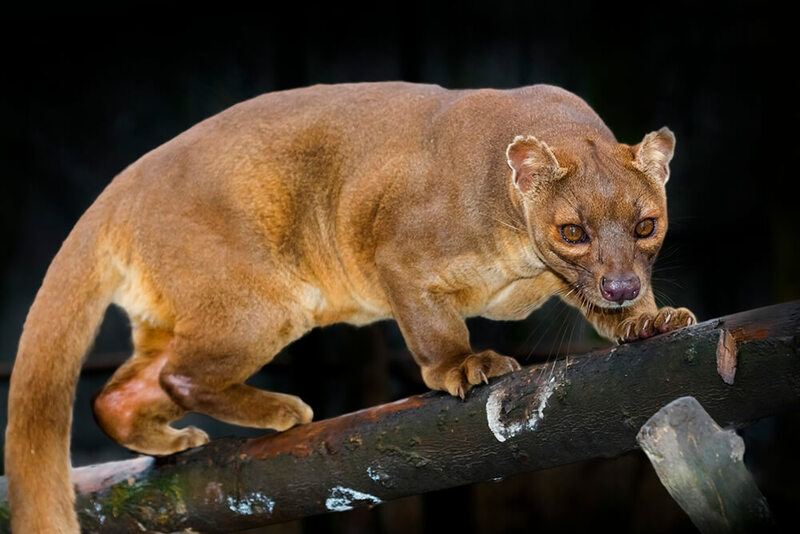 The fossa is an intelligent, agile animal that moves with ease high up in the trees of its forest home, even though the animal can weigh up to 22 pounds (10 kilograms). That extra-long tail helps the fossa balance and jump from branch to branch. Retractable claws like those of a cat and flexible ankle joints help it climb down a tree headfirst! Although it spends a lot of time in trees, the fossa is just as comfortable running flatfooted like a bear along the ground. There is still more to learn about the rare fossa. Until recently, it was believed that fossas were nocturnal because they were so hard to find in the wild. Recent studies show that fossas nap and hunt day or night, depending on mood or circumstance. A fossa can travel up to 16 miles (26 kilometers) in a day. It is solitary except during the breeding season. As a carnivore, the fossa is an excellent hunter. It preys on small- to medium-sized animals from fish to birds, mice, and wild pigs. But lemurs are its main food source, and the fossa is Madagascar's only predator able to kill the largest lemur species. To catch a lemur, a predator must be faster than it is—and the fossa can out-maneuver the swiftest lemur. It can jump, scurry, and dash, revealing little more than a tawny blur. The fossa is an ambush hunter: it uses its forelimbs and claws to catch its prey, killing it quickly with a bite from its sharp teeth. Fossas at the San Diego Zoo and San Diego Zoo Safari Park are fed dried cat food, a fortified meat-based commercial diet made for zoo carnivores, mice, and large knucklebones. Fossa pups develop slowly and don't leave the den for about four to five months. Fossas use scent to communicate and keep track of each other, scent marking rocks, trees, or even just the ground with scent glands on the chest and under the base of the tail. As solitary animals, their home ranges rarely overlap. The only time they seem to vocalize is during breeding: the female mews to attract males; males howl and yowl when competing for a female. A fossa may roar to intimidate a fellow fossa or in defense. Fossa pups make a purring sound when nursing or near their mother. Fossas are ready to start their first family when they are about four years old, and breeding season is between September and December. When it is almost time to give birth, in December through March, the mother makes a den in a place like an old termite mound, underground den, a rock crevice, or the hollow of a tree. There are two to six white-haired pups in a litter, and they are born toothless and with their eyes closed. The mother raises them without help. Fossa pups are very dependent on their mother for the first few weeks. Their eyes begin to open and their fur begins to darken when about two to three weeks old. The pups develop slowly and don't leave the den for about four to five months; they are dependent on their mother for another eight months. To get the mother's attention, the pups make a high-pitched noise called mewling. Fossa youngsters continue to grow until about two years of age. They then find a space of their own and usually only meet up with other fossas during the fall breeding season. The San Diego Zoo’s first fossas were two young males, gifts of the Malagasy government in 1967. It was several years before our first female arrived as part of a pair from the Basel Zoo in Switzerland, and we celebrated our first fossa birth in 1989, the first such birth in the Western Hemisphere. Since then, 32 pups have been born at the Zoo over the years. At the San Diego Zoo's new Conrad Prebys Africa Rocks exhibit, guests can see fossas in the Madagascar Forest habitat. In addition, the Zoo has two fossa animal ambassadors—brothers Isa and Jamba—currently the world's only ambassador animals. Both were hand raised after being rejected by their mother. They now help spread the word about their species through appearances at special events and on television, and meeting Zoo guests up close on walks around the Children’s Zoo. Marooned on Madagascar for millions of years, the fossa became the largest native carnivore and dominated the island. Today, fossas are classified as a vulnerable species, with only about 2,500 in the wild. As one of the island's top predators, fossas do not have natural enemies. Yet it is estimated that 90 percent of Madagascar’s native forest habitat is gone, and what is left is considered a key biodiversity hotspot. It is home to 35 lemur species, but lemurs need the forest to survive. In turn, fossas depend on lemurs as a food source. Fossas also have to compete for food with introduced species like civets. And there are diseases that threaten fossas: for example, rabies was introduced to the island by domestic dogs and wild cats. Fossas also face another hurdle: they have an unfavorable reputation with villagers, who see them as vermin, competitors for resources, and predators of farm animals. They tell bedtime stories of fossas snuffing out campfires and killing entire coops of chickens. These exaggerated stories have unfairly blown the fossa’s reputation out of proportion. Yet because of this sinister standing, many Malagasy people fear fossas and consider them dangerous. The fossa has help, though, because it is protected from export and trade. Ecotourism also helps the fossa and other wildlife in Madagascar. When people travel to this island to see its amazing biodiversity, their visits provide money for the local people and encourage them to keep the forests as they are. You can help us bring fossas back from the brink by supporting the San Diego Zoo Global Wildlife Conservancy. Together we can save and protect wildlife around the globe. The modern mongoose and the fossa evolved from the same ancestor, which arrived on Madagascar about 21 million years ago. Fossas have scent glands that release a stinky smell when the animal is irritated or frightened.